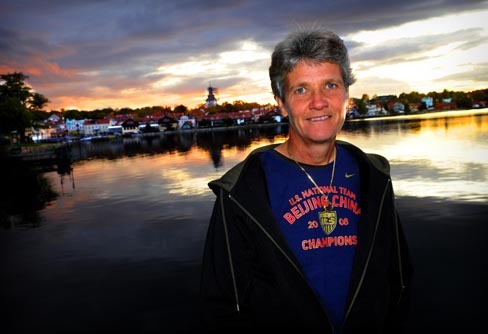 Arguably this could be considered the biggest weekend of Pia Sundhage’s professional life. Tomorrow she will lead the players of the United States Women’s National soccer team to their first World Cup tournament in over a decade. Those that follow the sport and know of Pia Sundhage consider her to be the most laid-back high level football coach in the world. She’s seemingly always happy, even after her team loses, and she subscribes to a theory that she calls the “7+1 rule,” where she gives only one piece of criticism for every seven compliments that she gives to her players. After watching the following interview, I’m thinking that Pia lives the philosophy she preaches as well. Great stuff. Good luck Team U.S.A.